Tucked away in a small pine forest, there is a cozy brand new cabin, with just the right mixture of action packed adventure and the calming peacefulness you've been waiting for. Ideally located between Bloomington and Nashville, Stephens Creek Cabin provides convenient options for dining out, shopping, and attending various functions at Indiana University. As you head down the drive lined with mature pine trees, a soft aroma of pine and woods fills the air, instantly removing any stresses and worries. Now your amazing vacation begins! Stephens Creek Cabin has a warm, soft feel that makes you feel right at home. The cabin offers an open floor plan, carefully designed with your comfort and convenience in mind. The fully equipped kitchen has an eat-in bar area open to the living room. Stephens Creek has canisters of flour and sugar, a full spice rack, salt & pepper and coffee filters for a 12 cup Mr. Coffee. In the living room enjoy a new 37" high definition television with cable and some movie channels. There is also a blue Ray DVD player and sound bar for your viewing pleasure. Relax in front of the gas wall heater on the new soft, comfortable futon. Do you need to call home? No worries. The cabin has unlimited long distance. There is also a voicemail system available to you during your stay. Keep in touch with loved ones without running up your cell phone bills. How nice is that? Stephens Creek Cabin has two bedrooms, one on the main level with a queen sized bed overlooking the pond, with a 32" cable TV and blue ray mounted on the wall; and one in the open loft area, accessible by ladder only, with a king sized bed. There is one full bath with a shower. 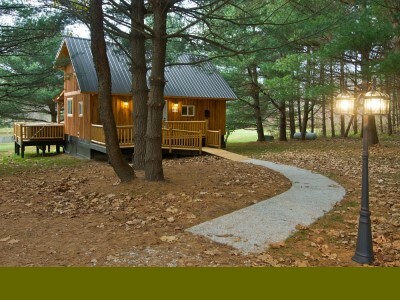 Now that we've told you about some of the ways to relax inside Stephens Creek Cabin, how about some outdoor adventure? Just outside the back door is an oversized deck. The two level deck offers a small screened in dining area on one end and a cozy hot tub area on the other. There is a large charcoal grill in the middle, and the entire deck overlooks a half acre fishing pond. Step off the deck for some fun outdoor games provided for you. There is plenty of flat walking ground and flat areas to enjoy the regulation horse shoe pit, volleyball net, and tether ball. This cabin is equipped with an IPOD docking system with CD player that can be used with many different sizes of IPODS. This system is for use with the outdoor speakers. Behind the lake is National Forest, perfect for hiking and exploring nature. Don't be surprised if you see a deer. They often gather around property and by the pond area especially at dusk and dawn.There is a camp fire pit perfect for long conversations with friends and family. Roast hot dogs, make s'mores, or just enjoy the warmth of the fire on a chilly autumn eve. Stephens Creek Cabin is a new cabin designed for maximum comfort and privacy. Come enjoy all the cabin has to offer. We know you will have a great time. Come make some memories with us, you'll be glad you did!